If you intend to use any portion of this article in your training program, permission can be granted by writing the author. 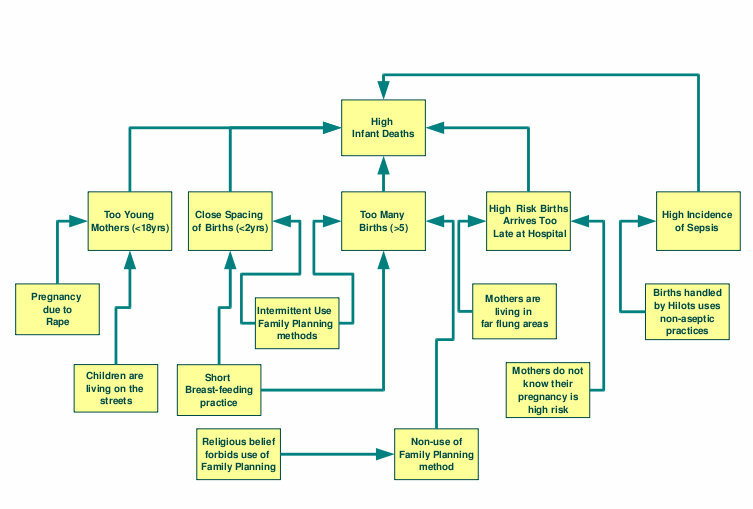 The illustration below of the stream analysis diagram is based on an actual problem analysis work undertaken by the author. It has been abridged by the author for teaching purposes. Stream analysis is an organizational diagnosis and change management tool. Its organizational diagnosis diagram uses boxes to refer to problem statements and arrow lines to refer to the cause and effect relationships of problem statements. Problem statements with most of the arrows coming in are called "effects" or "symptoms" of the problem environment, while problem statements with most of the arrows going out are called "root causes" of the problem environment. The use of Stream Analysis in project management is very similar to the Fishbone (Ishikawa) Diagram or the Problem Tree Diagram. In fact, given the same set of problem situation, a stream analysis diagnosis diagram can be converted to a Fishbone (Ishikawa) Diagram or to a Problem Tree Diagram.